Jean-Baptiste Poguelin. better known to the world by his pseudonym. Molière, was born in Paris on January 15th, 1622, the son of a prosperous upholsterer who later became attached to the court of Louis XIV and took charge of the royal furnishings. Little is known of his early years except that he was a gifted mimic, a frequent theatregoer, and a student of law. But by the time he was 21, he had started his theatrical career with the IIlustre Théâtre, throwing away all chances of following his father's footsteps. For at that time the stage was taboo: an actor was automatically excommunicated, and his body could not be buried in consecrated ground. 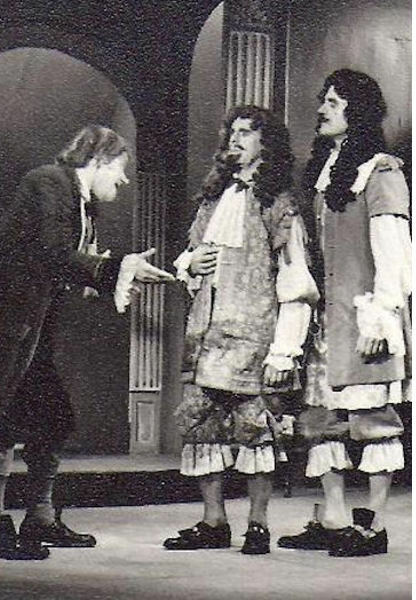 By 1658 Molière had become the official "court jester," and a favourite of the king, who gave his permission for the IIlustre company to share the Petit-Bourbon Theatre with the resident Italian company. This was, in effect, the foundation stone of the still famous Comédie Française. Molière, one of the greatest actors as well as the greatest dramatist of France, died after being seized with a fit, ironically during a performance of Le Malade Imaginaire, on the night of 17th February, 1673. In thirty years, by his own efforts, he had raised French comedy to the stature previously belonging only to tragedy. 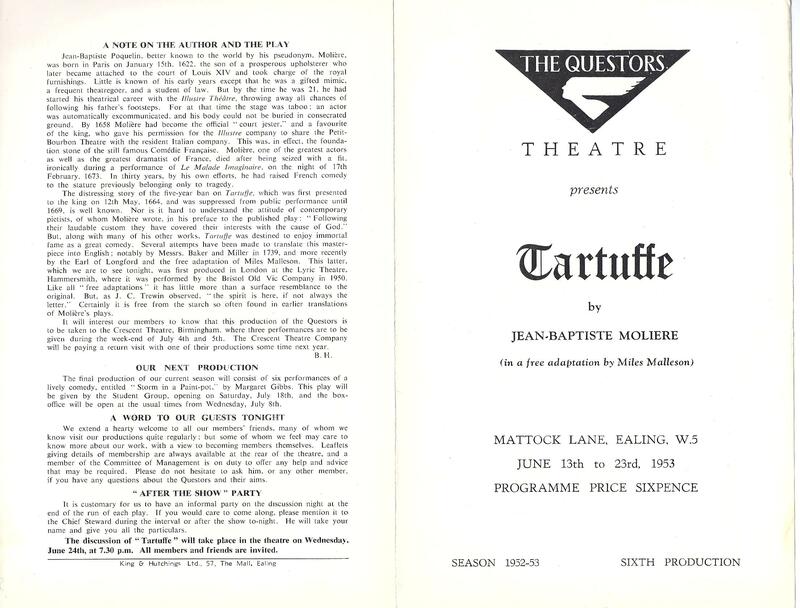 The distressing story of the five-year ban on Tartuffe, which was first presented to the king on 12th May 1664, and was suppressed from public performance until 1669, is well known. 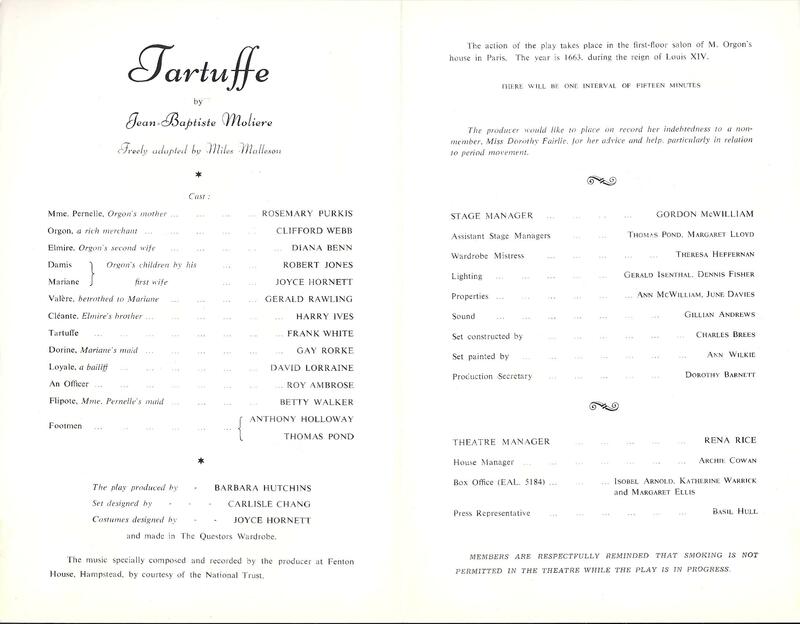 Nor is it hard to understand the attitude of contemporary pietists, of whom Molière wrote in his preface to the published play: "Following their laudable custom they have covered their interests with the cause of God:" But, along with many of his other works, Tartuffe was destined to enjoy immortal fame as a great comedy. Several attempts have been made to translate this masterpiece into English : notably by Messrs. Baker and Miller in 1739. and more recently by the Earl of Longford and the free adaptation of Miles Malleson. This latter, which we are to see tonight, was first produced in London at the Lyric Theatre, Hammersmith, where it was performed by the Bristol Old Vic Company in 1950. Like all "free adaptations" it has little more than a surface resemblance to the original. But, as J C Trewin observed, "the spirit is here, if not always the letter.'' Certainly it is free from the starch so often found in earlier translations of Molière's plays. It will interest our members to know that this production of the Questors is to be taken to the Crescent Theatre, Birmingham. where three performances are to be given during the week-end of July 4th and 5th. The Crescent Theatre Company will be paying a return visit with one of their productions some time next year.